Just when you think winter will never defrost your chilled bones, the sun comes out. It’s beginning to feel that way now. We’re rounding the bend with springtime tulips in sight and a new influx of vegetables at the farm stands. This recipe of Gilled Spring Vegetables and Feta has all the flavors of a fresh new season and a hopeless devotion to grill marks. Serve this salad warm or at room temperature alongside lamb skewers and toasted pita. Foodie Note: If using a bbq style grill, you may want a shield of tinfoil to protect onions from falling between the grates. Cut a large piece of foil, mist with non-stick stray, add onions and curl up the edges of foil like a tray. Place directly on grill; cook until onions are blackened in places and soft, about 8 minutes. Heat grill or cast iron grill pan to medium high. Cut lemon in half widthwise. You’ll use the juice from ½ the lemon in the dressing. Cut remaining half into ½” slices; these will be grilled. 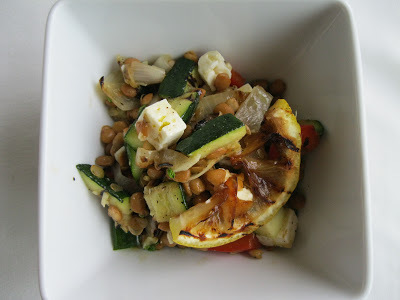 In a large mixing bowl, combine olive oil, zucchini, bell pepper, onion, salt and pepper. Toss to coat with oil. 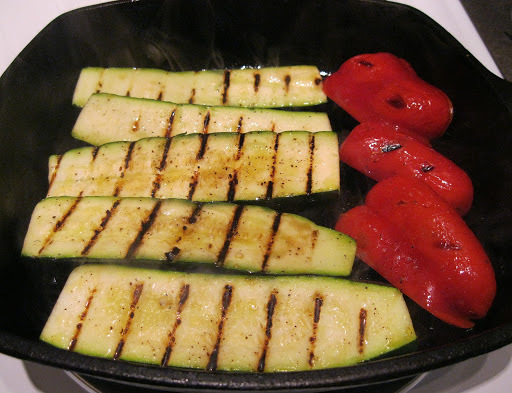 Once grill is hot, place oiled vegetables on grill (use tinfoil tray for onions if desired); cook about 5 minutes each side, or until grill marks have formed and vegetables have softened slightly. 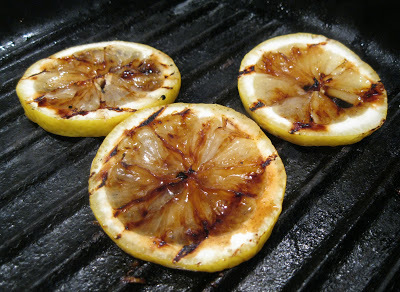 Grill lemon slices, about 2 minutes each side. Set everything on a plate to cool. Drain and rinse lentils. Once vegetables are cool enough to handle, cut lengthwise and into 1” chunks. Cut feta into 1” cubes. 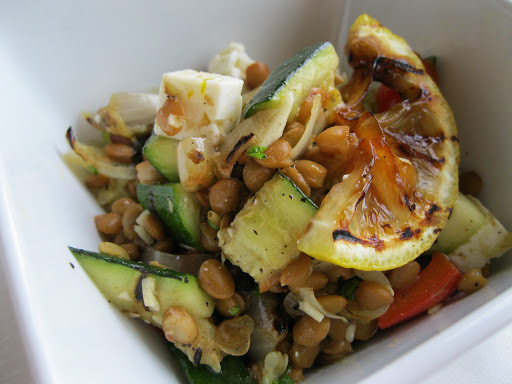 Combine vegetables, lentils, feta and parsley in a mixing bowl. Combine dressing ingredients in a jar with a lid. Screw on lid tightly, shake to emulsify and pour over salad. Toss gently; add ¼ teaspoon salt/pepper (or to taste) and plate onto serving platter. Cut grilled lemons into half moons and garnish slices over salad. *11-Olives provided the olive oil for this recipe. ← Easter Dinner Just Went Greek!